Foods that are high in protein are an important part of any meal plan. Protein is an amino acid the body uses in order to repair existing cells and to generate new ones. Generally, that average male needs 56g of protein each day, while the average female needs 46g. Carbohydrates are also an important part of diet as they are a source of energy in the body. However carbs stimulate the release of insulin which is the body’s main fat-storing hormone, so taking on too many carbs on a regular basis can cause weight gain. Foods that are high in protein and low in carbs are an ideal way to maintain weight and keep muscles lean. Most are also a good source of necessary vitamins and minerals. The following 21 foods can make sure the body gets the protein it needs without an excess of carbs. Eggs are an inexpensive food source high in protein. They are categorized as a nutrient dense food meaning they are high in nutrients and low in calories. One large egg contains seven grams of protein, all nine essential amino acids and 13 necessary vitamins. All this comes in a serving with only 75 calories and 0.4 grams of carbohydrates. The nutritional value of eggs is not affected by the color of the shell, the grade of the egg or whether or not it came from a free-range chicken. Eggs also don’t lose their nutritional value based on cooking methods. This versatile food can be scrambled, poached, hard-boiled or added to other foods for a nutritious, easily prepared meal. A principal ingredient in Chinese and Thai cuisine, tofu is a nutritious and popular food. It is made from soya milk that has been curdled, pressed into a block form and then cooled. Tofu comes in three varieties: firm, which can be cubed; soft, which can be used in dips and dressings; and regular, which has a consistency balanced in between the other two. Tofu is a powerhouse of nutrients. A four ounce serving contains seven to ten grams of complete protein and two to three grams of net carbs. Complete protein means that it has all nine essential amino acids. It is also a great source of iron, calcium, copper, zinc and other nutrients making it a great protein alternative to red meat and poultry. Grilled, baked or broiled, chicken is an excellent source of protein. Like most poultry, this lean white meat is also a carbohydrate-free food. Every ounce of chicken provides seven grams of protein. It contains all nine essential amino acids making it a complete protein food. Chicken is also a rich source of B3 and B6 vitamins. Low in fat and calories, chicken is a tasty way to get protein. Remove the skin and season with herbs and seasonings for an all-around healthy meal choice. Superfood salmon should be a common feature on any meal plan. Salmon’s popularity comes both from its taste and its health benefits. It is the third most frequently consumed seafood in the United States falling only behind shrimp and canned tuna. Salmon is a powerhouse of nutrients. It is loaded with high levels of protein, omega-3 fatty acids and vitamin D. It is also packed with B vitamins, which are important for turning food into energy, generating and repairing DNA and reducing inflammation. Salmon is free of carbohydrates. Regular consumption may help reduce risk factors of many diseases. Its taste has a light flavor, not ‘fishy’ like other seafood making it easy to incorporate into diets. There are many different ways to cook salmon such as grilling, baking, steaming, smoking and many others so frequent servings will never be boring. A most popular during the holidays, turkey can still be enjoyed all year long. This healthy protein is naturally low in sodium, making it a great choice for sandwich meats or as an alternative to ground beef. Turkey is also versatile; it can be cooked in many of different fashions and can be used as a substitute for other meats in many recipes. One three-ounce serving of turkey contains up to 26 grams of protein and three to four grams of carbs. It is a good source of phosphorus, zinc, iron, potassium, B6 and niacin. Without the skin, one turkey breast has 8% more protein than a similar-sized chicken breast. Crab meat is an extremely healthy food, especially when eaten plain and steamed. It is free of carbohydrates, high in protein and chocked full of B vitamins and other minerals. Imitation crab meat does not provide the same benefits, so always take care to buy the real deal. The few calories that are in crab meat come mostly from protein. With just 98 calories, a three ounce serving contains 20 grams of protein. Crab meat is also a good source of chromium, zinc, copper and vitamins A,B and C.
Lamb is a red meat that comes from sheep that are under a year old. It is a great source of protein that is free of carbohydrates. There are many options in cuts from small chops to the whole leg. A four ounce serving of lamb meat contains 27.5 grams of protein. It is also high in riboflavin, niacin and vitamin B12. Add in high amounts of zinc, copper and iron and it easy to see why lamb is a quality, healthy meat option. Depending on the cut, pork is an essentially carb-free way to get lots of protein. The best type of pork to eat is the tenderloin, which is considered to be ‘extra’ lean while other cuts are considered just ‘lean.’ The amount of protein contained varies depending on the pork style with a three ounce loin containing 22 grams while a slice of bacon only containing about three. Aside from the tenderloin, extra-lean ham is also a great choice for a high protein low carb food as compared to sausage, bacon and other cuts that are also high in fat. Grill, broil or roast for a easy and quick healthy, scrumptious meal. Tuna is one of the most popular fish available and for good reason. It is a relatively inexpensive, tasty and healthy alternative to red meat and poultry. Though fresh is best, tuna still retains its nutrients when used out of the can. An excellent source of protein, one can of tuna has more than 80% of the recommended daily requirement. It has high levels of antioxidants, iron, selenium, B12, potassium and many other essential vitamins. With all this packed in, tuna remains a zero-carb food source. Regular consumption of tuna can result in positive changes to the body. These include lower blood pressure, a stronger immune system, a lower risk of heart disease and cancer prevention. As if those weren’t enough reason to enjoy tuna, it can also boost energy levels, help skin look vibrant and aid in weight loss. Found throughout the North American continent, goose is a carb-free migratory bird that is also high in protein. Once on the verge of extinction, in recent years the goose population has exploded. Goose is a wonderful waterfowl to bring to the table. A three ounce serving of goose contains 19.35 grams of protein. It is a good source of potassium, sodium and phosphorous. Though not typically found at the local grocer, goose meat can be purchased online or at specialty stores. This red meat from cattle is a complete protein food that can be cut and cooked in countless ways. From ribs to roasts, steaks to ground, beef is high in protein, free from carbs and full of vitamins and minerals. When choosing beef, opt for lean cuts with ground being a 90/10 mix and be sure to trim all visible fat before serving. The amount of protein contained in beef typically depends on the cut of meat. Lean, cooked roasts and sirloin steaks deliver 29-36 grams per every four ounces while the same serving size of ribs delivers 30.5 grams. Beef is dense in many vitamins and minerals including zinc, iron, selenium, B6 and 12 as well as many antioxidants. A popular fixture in Chinese dishes, duck has long been outweighed by turkey and chicken in the United States. Whether this is due to availability or the fact it takes longer to prepare remains to be seen. But, like its poultry cousins, duck is a great source of protein and extremely low in carbohydrates. A three ounce serving of duck meat possesses 16 grams of protein with less than one gram of carbs. It is also full of a wide range of vitamins and minerals including B vitamins, zinc, selenium, iron, potassium and phosphorous making it a good reason to get quackin. Cod is a delightfully mild fish found in both the Atlantic and Pacific oceans. While the nutrient levels differ slightly, both types contain the highest volume of protein per calorie for fish and are free from carbohydrates. A three ounce serving of Pacific cod provides 15.9 grams of protein for just 72 calories. Atlantic cod is slightly higher with 19.4 grams in 81 calories. This serving size also provides 133% of the adult male allowance for vitamin D as well as 82% of the recommended daily allowance of B12. Whether chilled, hot or straight off the barbie, shrimp are a delicious way to get the recommended 8 ounces of seafood needed each week. Shrimp are high protein, free from carbs and stacked with vitamins and minerals. Shrimp are comprised of mostly protein, with a three-ounce serving supplying around 20 grams. One medium sized shrimp is only seven calories, meaning a serving size of a dozen is still under 100. Other nutrients provided include selenium, phosphorus, copper, B12, iodine and tryptophan. To keep from losing the many health benefits shrimp provide, be sure to stay away from those that have been breaded, butter-coated or fried. It is also important to keep an eye on sauces, as many make it easy to dip in and stack on the calories. Tilapia is swimming its way to the top of popular fish. It is an affordable option and one of the most mild-tasting varieties available. This lean white fish that is high in protein, low in calories and is carb-free. Tilapia is considered a complete protein, containing all nine essential amino acids. A single four ounce serving contains 23 grams of protein. Other vitamins and minerals found in tilapia include phosphorous, selenium, omega-3 fatty acids, and potassium. The health benefits associated with regular tilapia consumption are numerous. It can help to boost metabolism and reduce weight, lower triglyceride levels and reduce signs of aging. The overall boost to the immune system tilapia provides can also help to prevent cancer and other chronic diseases. Although not yet mainstream, bison is rapidly becoming a popular source of protein. It is a carbohydrate-free food source that makes a great alternative to ground beef and other fattier protein possibilities. Bison is a protein-dense food. It contains 22 grams of protein in a three ounce serving size, almost four times more than eggs. Over half the calories in ground bison come from protein. It is also a good quality source of magnesium, zinc and potassium. Brazil nuts are not nuts at all, but are actually seeds from the Brazil nut tree. They are not only a great source of protein, but also have the lowest carb count of all nuts. Brazil nuts are good for the heart, skin and immune system. Every 100 grams of Brazil nuts contains 14.4 grams of protein and 2.4 carbs. They are grown in soil rich in the antioxidant selenium. In fact, it takes just two nuts to reach the daily recommended amount of the mineral, helping to keep free radicals at bay and cells healthy. Whether added to a salad or simply enjoyed by the handful, walnuts are a healthy food high in protein, low in carbs and full of nutrients. They have anti-inflammatory properties, mood boosters and can improve metabolism. They are the only nut that contains omega-3 fatty acids, making them a good choice for vegetarians or those who don’t care for meat. Walnuts possess 14.4 grams of protein and just 3 grams of carbs in a 100 gram serving. They are a good source of magnesium, iron, calcium, zinc and copper as well as vitamins A, B6, B12, E and K. These crunchy delights are easy to store and carry so their health benefits will always be at arm’s reach. While most dairy products are high in protein, many also have a high amount of carbs. Thanks to the fermentation process, the amount of carbs present in cheese is significantly reduced without taking away from the protein content. The longer a cheese is aged, the lower the carb count will be. It is important to be careful when choosing a cheese as they are not all the same. Those with low moisture contents typically have a higher amount of protein. Parmesan has the highest total with 10 grams per ounce as compared to the average of other styles at six to seven grams per ounce. Overall, cheese is an easy way to increase protein intake while keeping carb count low. When choosing a cheese, stay away from fresh products as they still contain a large portion of the carbohydrates found in milk. Also steer clear of ricotta and cottage cheese as well as cheese spreads as these contain the lowest amount of protein. Greek yogurt differs from regular yogurt in that it is further processed to remove excess lactose, water and minerals. For those that need to avoid meat, this thicker and creamier version is an excellent protein substitute. Greek yogurt can be enjoyed by itself or used in recipes. A serving of Greek yogurt contains up to twice the amount of its regular coutnerpart with 12-17.3 grams per serving. Greek yogurt has about half the carbs of regular yogurt at nine grams per cup. It is also loaded with probiotics that help increase the immune system and decrease digestive problems. Seitan is a meat substitute derived from wheat gluten that is combined with seaweed, ginger, garlic and soy sauce. Formed into cubes and loaves, this ‘wheat meat’ is extremely high in protein and low in carbohydrates. It is considered a low energy-dense food because it has a low calorie to serving size ratio with only 100-120 calories per three-ounce serving. The protein content in seitan is high because it is produced from the gluten portion of wheat. There are 21 grams of protein in a three-ounce portion with the same serving size also containing up to four grams of carbohydrates and two grams of fiber. For vegetarians or others who need to limit the amount of meat in the diet, seitan makes a great alternative. 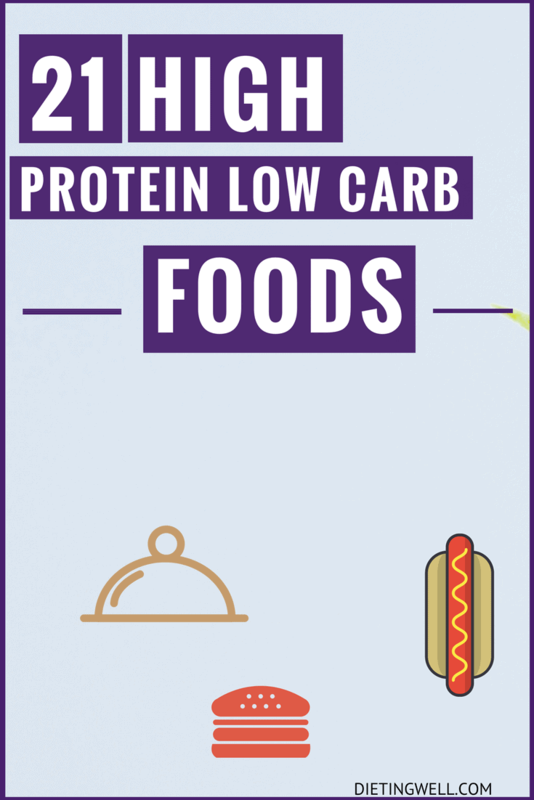 While it is always important to consult a healthcare professional before drastically changing diet, incorporating more high protein and low carb foods can provide a wide range of benefits. These foods supply the body with essential nutrients while satisfying the appetite making weight loss and maintenance less difficult to achieve. High protein, low carb foods have also been found to aid in disease prevention and management. A recent study found that these foods can help to slow tumor growth and actually prevent the onset of cancer. For Type-II diabetics, adding high protein, low carb foods can help improve glycemic control. 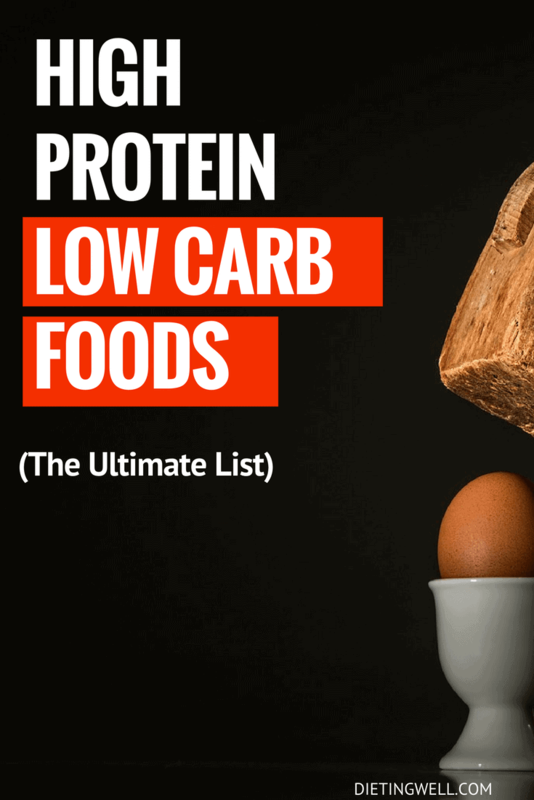 Whether part of a full blown diet plan such as Atkins or CSIRO or just incorporated into daily eating, high protein, low carb foods are something to consider. From weight loss to disease prevention, these 21 foods have a lot to offer. What do you think about these foods? Let me know in the comments section below! Thank you. . What substitute can I have for milk in my tea? Are cowpeas and peanuts accepted?